Reaffirming its commitment towards providing best-in-class services to its customers, India’s leading Commercial Vehicle brand Tata Motors’ has launched first-of-its-kind three-months long Free Engine Health Check-up Service Camp from 1st April – 30th June 2019. The service camp is aimed to educate customers and drivers about the importance of engine and vehicle maintenance. The company will be organizing this service camp across 1500+ dealer and Tata Authorized Service Stations (TASS) for all commercial vehicles customers across the country. Devoted towards the comfort and wellness of our truckers, Tata Motors will be organising workshops to explain the benefits of vehicle maintenance such as fuel efficiency, maximizing vehicle performance and enhancing return on investment. This initiative will be supported by esteemed company vendors namely Cummins, Bosch, Lucas, Delphi, Fleet Guard, SEG, Turbo Energy, Tata Toyo, Banco and Alkraft by their presence in the campaign. • Customer Care App: A single window mobile application, which gives access to a host of features including emergency SOS, Service Booking facility, Maintenance tips, Service History, Dealer location GPS Trip Meter etc. • Tata Alert: Tata Alert offers you 24 x 7 breakdown assistance & support for your Tata vehicle, so that your business functions nonstop. • Tata Zippy: Tata Zippy offers the shortest possible uptime of new vehicles, which come in for repair so that your journey to success faces no delays. • Tata Kavach: Tata Kavach ensures that your business never goes off-track by offering the shortest possible uptime of vehicles, which come in for accidental repair. • Service Onsite: To meet tight project schedules, tippers are deployed on-site, which are away from town-based dealers or TASS, get on-site service through on-site packages. • Mobile Service Van: With this service, customers can avail quick services at their doorstep. • Mobile Workshop & Container Workshops: 250+ Mobile Workshops and 550+ container workshops that are equipped with all tools and equipment, providing onsite service to vehicles across India, to save time and cost of repair. 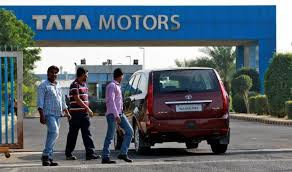 Tata Motors continues to invest in its products and sales & service network, redesigning, developing & deploying modern dealerships, with an aggressive customer centric approach of anticipating customer requirements. With over 1800+ touch points across the country, the company hopes to significantly improve customer experience and convenience, while also improving penetration and driving quality, thereby building strong, lasting relationships with its customers.